Anyone who ever orders takeout has almost certainly encountered the scourge of bad Thai food. And this week the Thai government announced a plan to combat this problem—with a robot. Thailand’s National Innovation Agency spent a third of its annual budget on a machine it claims can tell the difference between genuine Thai food and, let’s just say, fake Thai food. The desire for a Thai stamp of approval came after former Prime Minister Yingluck Shinawatra claimed she encountered food all over the world that was not fit to be called Thai. That got us wondering what makes some of the most popular dishes on menus here in the United States so inauthentic. To get the answers, we talked with cookbook author J.J. Goode, who worked alongside America’s current king of real Thai food, Andy Ricker, on last year’s Pok Pok. With that said, here are five popular dishes that the Thai robot will likely be after—and why. This is a big one. 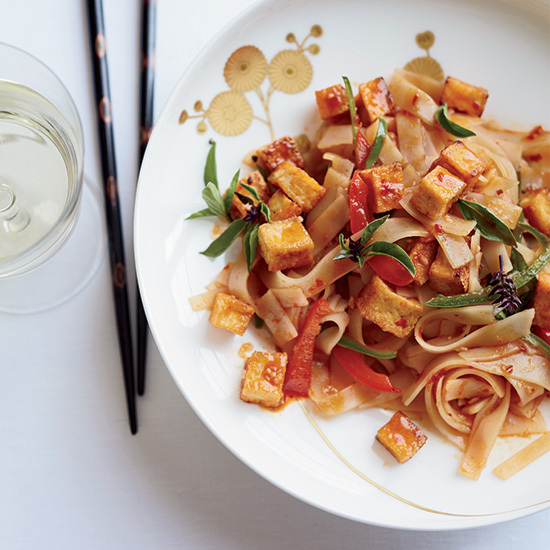 Originally, drunken noodles didn’t contain noodles at all. The name basically means “drunkard’s stir-fry.” It’s made with noodles now, even in Thailand, because, well, people like noodles. But what the American version is missing is some of the emblematic seasonings: krachai (so-called wild ginger), fresh green peppercorns, holy basil (I’d bet real money that most American versions use Thai basil, which is not the same) and an assortment of chiles to provide heat as well as different flavors and aromas. In Thailand, good pad Thai tends to be significantly sparer than American versions. Instead of a sweet, gloppy, saucy jumble, the noodles in good Thai versions are seasoned with a mixture of tamarind water, fish sauce and palm sugar. You also get lots of flavor from dried shrimp, salted radish and garlic chives, as well as the pork fat it’s typically cooked in—all ingredients missing from most American versions. One thing you will not see overseas is chicken. If you spot any chicken in your pad Thai in Thailand, you know you’re eating tourist grub. In the US you almost always see the central Thai version of papaya salad. It has a sort of sweet, tart and spicy thing going. The version favored in the northeast Thailand (and Laos, where papaya salad was likely born) is fiery from dried chiles rather than fresh ones; funky from salted black crab and unpasteurized, unfiltered fish sauce; and barely—if at all—sweet. This one is interesting because the most common criticism of American Thai food is that it’s too sweet, but green curry actually should be quite sweet. The full name is kaeng khiaw waan—basically “curry green sweet.” Many versions in Thailand are thinner and not as coconut heavy, which counterintuitively, means more flavor and intensity. Also different is what’s in the curry. Instead of the American tofu-chicken-shrimp thing, you’ll see pork or fish balls along with Thai apple eggplants instead of regular eggplant. And please, no bell peppers. One other big difference is in the way it’s served. Here we get a giant bowl of rich curry and that’s our meal. In Thailand, you might get funny looks if you ate that much on your own. It’d be like going to a steak house alone and ordering the rib eye for two. Most American Thai restaurants have nothing but tom yam goong, a simple shrimp soup they make with sad button mushrooms. That version can be delicious but there are so many delicious tom yam (which basically means “boiled mixed”) or tom saep, as the dish is known in northeastern Thailand. Some of the best are actually made with pork ribs or offal. American flavors are also off. In Thailand they tend toward the sour, salty, spicy rather than the sweet, sour and a little spicy of most takeout versions. So the next time you’re making that Seamless order, just know that somewhere out there a robot is judging you for your choices.